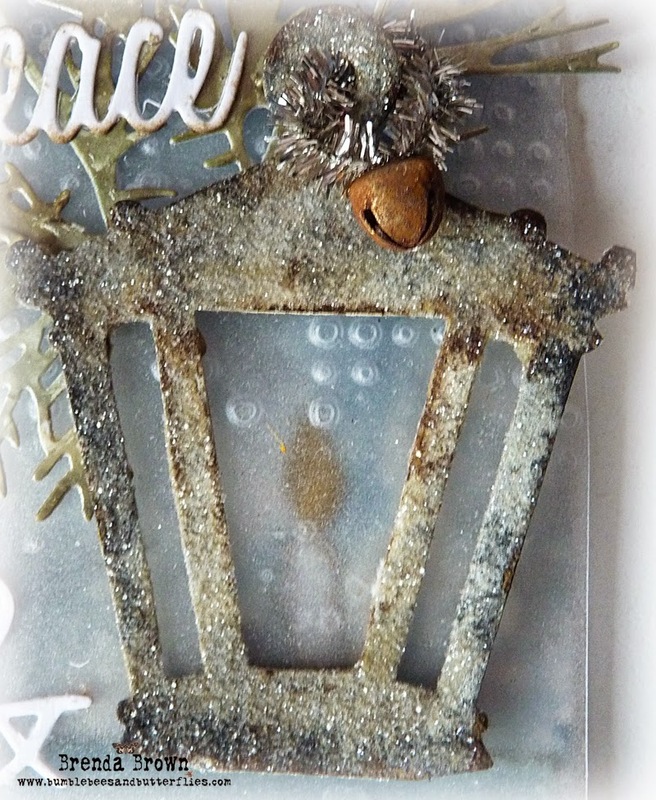 I am so pleased I managed to find a bit of time today to get my last Tim tag of the year done, all the details and process steps for Tim's own tag are over on his blog. Although I have got the prancing deer that he used, I decided to go with a lantern which reminded me more of the new year and the candle signifying peace. In fact you will see candles from me again very soon. The little clip at the top of the tags is one I bought when I went back to my home town of St. Ives recently (near Cambridge). One of my old school friends was working in a vintage shop in town so I popped in to see her and found them, they have a hook on them so the tag can be hung up. Well it's New Years Eve tomorrow, have a great day and evening I will be back Thursday with two posts to start the new yeatr. I can't go without giving my huge thanks to Tim for an amazing year of creative inspiration and these wonderful monthly doses of sheer brilliance. As I am so late (again!!!) getting this completed and linked to Tim's blog, I won't have so much time to wait till the next one. I shall now pop over to his blog and link my tag for the last time this year. Perfect! I love the lantern & candle. Firstly, I hope you have a fantastic 2015. And secondly, the Tag is wonderful,I like the finish of your Lantern also; it is so full of texture and we all love that do we not? I never found the Antiques shop in St Ives! I must tell you that I have your little altered note book on my craft desk, I have not written in it yet, Iam just enjoying looking at the moment, it always brings back the memory of our meeting...thank you for that. 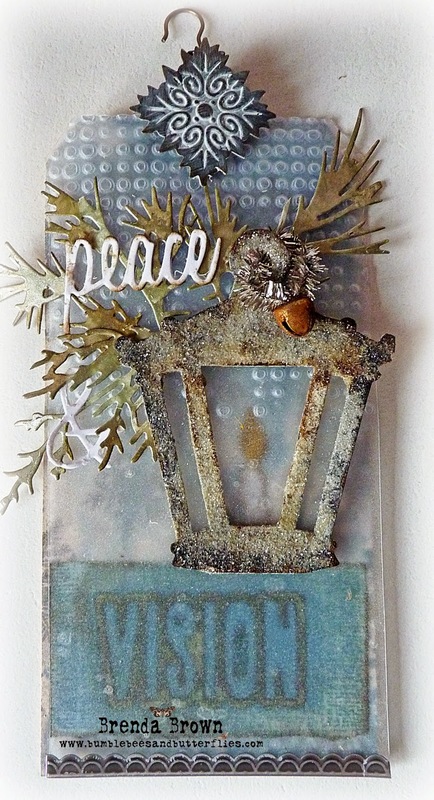 Love this tag and that gorgeous lantern! Great take on Tim's final tag for 2014! Wishing Ken and you a wonderful New Year! Hugs! LOVE LOVE LOVE the lantern and the view of the candle is so subtle and perfect! Most excellent take! Happy New Year!!! A beautiful tag Brenda. happy New Year to you and your family. Beautiful. The frosted appearance on the lantern is so effective and so realistic. Brenda, wishing you and yours all the very best for the New Year. Thank you for your friendship and support in 2014. 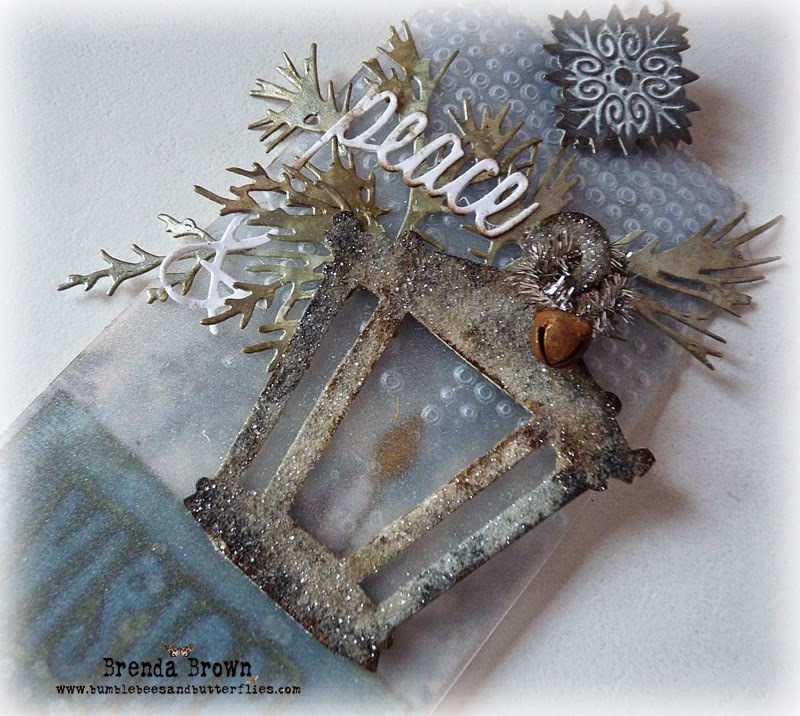 It's lovely, Brenda - so serene and full of light and hope. Have a very happy 2015!